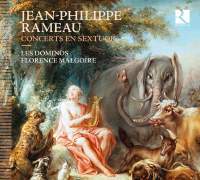 Ensemble Amarillis commemorate Rameau with a balanced offering alternating two chamber cantatas and two chamber concertos from Pièces de clavecin en concerts (1741). Orphée was composed at least 20 years earlier, when Rameau was organist at Clermont Cathedral before he relocated to Paris: the hero departs with Eurydice on a gloomy path out of Hades but cannot withstand not being allowed to turn around and look at her; he laments losing her forever. Le berger fidèle was performed at the Concert Français in 1728: the shepherd Myrtilus bewails the angry instruction of Diana to sacrifice his lover Amaryllis, but his pleading placates the goddess and he looks forward to a joyful reunion with his beloved. The cantatas were written for sopranos but Ensemble Amarillis choose to perform with the tenor Mathias Vidal, claiming that his ‘timbre at once powerful and mellow… reflects our wish to restore all their liveliness and their vivacity to these miniature dramas’. I’m unconvinced that a soprano cannot do this sufficiently but Vidal is a transparent story‑teller who delivers the key dramatic moments in each cantata mellifluously, strongly, plaintively or gleefully as required. Liberal reassignment also occurs in the instrumentation of all four works, with oboe, recorder and violin used interchangeably. Héloïse Gaillard’s choice of oboe in ‘La Laborde’ (Deuxième concert) overpowers Marianne Muller’s gentle viola da gamba and Violaine Cochard’s articulate concertante harpsichord, although the balance is sweeter in ‘La Boucon’. I preferred the subtler textural balance and consistent aesthetic achieved when the top part is played exclusively by violinist Alice Piérot throughout the Cinquième concert, including sublime tributes to members of the viol‑playing Forqueray and Marais dynasties.